Lift Pilot Hydraulic Pallet Lifter - Extendable Forks - 2,500 lb. Cap. 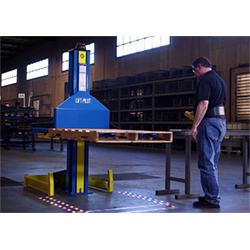 The Lift Pilot helps reduce worker fatigue by raising pallets to an ergonomic work height to reduce bending and lifting. Lift forks are telescopic and extend out to 40" or 48", and when not in use, retract back into the unit for a minimal footprint. Sensors tell the lifter when there is a pallet in place ready for pick-up, if the forks hit an obstacle while extending or if there is an object underneath a lowering pallet. 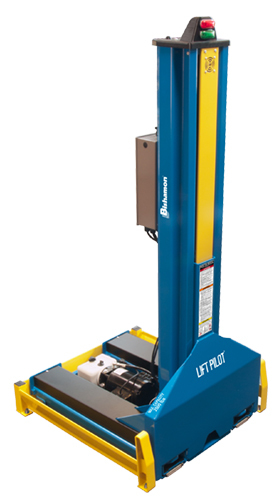 The lift pilot uses an adjustable minimum fork height design that adjusts from 3.6" to 4.6" so pallets and skids can be positioned with a pallet truck and lifted from the floor, cutting out the need for a forklift. The lift, fork height and fork length are controlled via the operator console on the back of the machine or the hand held remote for up and down lift control. Fork Lowered Height: 3.6" - 4.6"
Fork Length: 40" - 48"
Pallet Level Loader - Powered Hydraulic, 2000 lb. Pneumatic Lift, 30"W x 51"L table, 1500 to 2000 lbs. cap.